Claim up to €/$/£480 welcoming bonus Play Now! 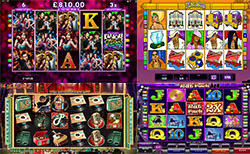 Immortal Romance was released back in December 2011, yet has managed to remain as one of the most played slot titles at Microgaming casinos online. That seems fitting for a slot game with a vampire theme at the centre. Starting with the technical aspects, it is possible to play Immortal Romance on either desktop or mobile devices, including Android and iOS, and still enjoy a smooth experience in which the gothic visuals are crisply displayed. When playing the Immortal Romance slot, it’s clearly visible that the game uses five reels and three of symbols for the overall structure. The reels are then spun on each round, with the symbols randomly coming to rest in various combinations. In total, there are 243 ways of winning and the symbols can be matched adjacently from left to right along the reels. This stands in contrast to the Microgaming slots that challenge players to combine symbols along paylines with fixed positions. To play Immortal Romance, players need to assign a coin value, which can start from just €0.01. The next stage of the wagering process calls for players to stake from one to 10 coins. Once satisfied, players can use the spin button to start playing. The Immortal Romance logo is used for the wild symbol, which can substitute and doubles the value of winnings when used. • Amber: receive 10 free spins, a 5x multiplier, and the chance to retrigger. • Troy: after five times, gain 15 free spins and Vampire Bats to randomly gain 2x or 3x multipliers. • Michael: 10 triggers will provide 20 free spins and Rolling Reels that can boost the multiplier to 5x. • Sarah: 15 triggers of Sarah will deliver 25 free spins and Wild Vine. Land the Wild Vine symbol on the third reel to randomly transform into further substitutes. The art style of Immortal Romance has proven to be long-lasting and the slot provides stable performance at Microgaming casino sites. As for the gameplay, Immortal Romance has a high return to player percentage of 96.86% and can trigger four levels of free spins.